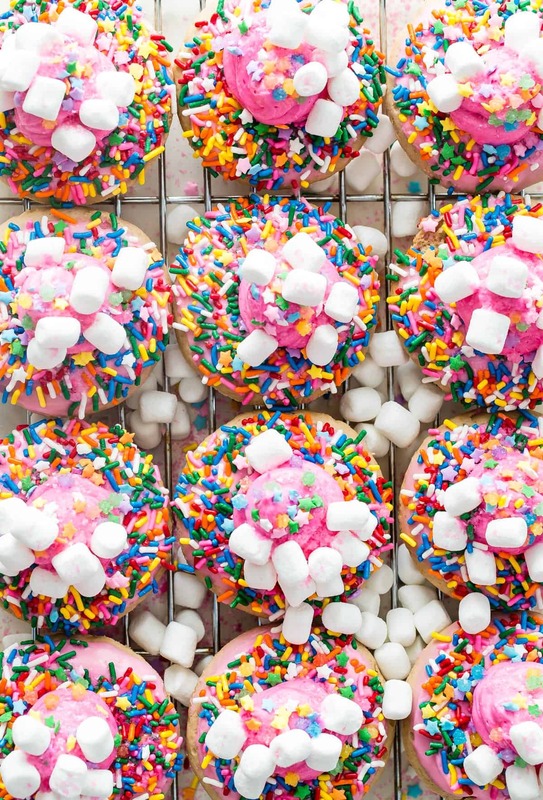 Baked Strawberry Donuts covered in an absurd amount of unicorn sprinkles and mini marshmallows! These color explosions are guaranteed to put a smile on your face. I approve, especially if it has anything to do with baked strawberry donuts! Am I the only person who hasn’t heard about the unicorn hype? It seems like a legit thing with the a crazier-the-better attitude. This isn’t my usual recipe pick for you guys at all. But with everything being so crazy and frantic on the news and social media lately, it seems that unicorns could be the only thing to save our minds from exploding. Both my kids went bug-eyed when they saw these rainbow burst donuts. They might even say I’m sort of anti-sprinkles, I’m always on them to not use too much if they’re tricking out some ice cream at home or making Christmas cookies. And then they saw this happen, nice one Dad. Now I can never ever mention anything about using too many sprinkles again in my life. Actually It was kinda fun to just go all out with the color and not really have to worry how things would turn out. But wow, things got pretty messy…and pink. I even think the dog got his fair share of sprinkles that fell on the floor. Now I have a boatload of rainbow sprinkles in the cupboard screaming at me to be used in something else. I’m already trying to come up with more unicorn creations, so leave a comment if you have any ideas. Have a delicious weekend everyone, I think there’s some football being played! Preheat the oven to 350 degrees F. Spray a donut pan with nonstick spray and set aside. Beat the butter and both sugars together until creamy. Add the eggs one at a time and beat until well combined, scraping down the sides of the bowl each time. Whisk the flour and baking powder together and gradually add to the batter. Add the preserves, vanilla and milk and beat until well mixed and smooth. Using a large piping bag, pipe the batter into each space in the donut pan level with the surface. Bake in the oven for 12-13 minutes and let cool for 5 minutes before transferring to a wire rack to cool. Repeat until all of the batter has been used. 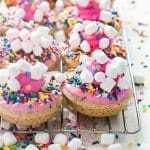 Once the donuts are cool, make the glaze by mixing the powdered sugar, milk, vanilla and red food coloring in a microwave safe bowl. Prepare your sprinkles on plate ready to dip your glazed donuts into. Mix well until smooth and then heat in the microwave for 10 seconds at a tie until the glaze is pourable but not too runny. 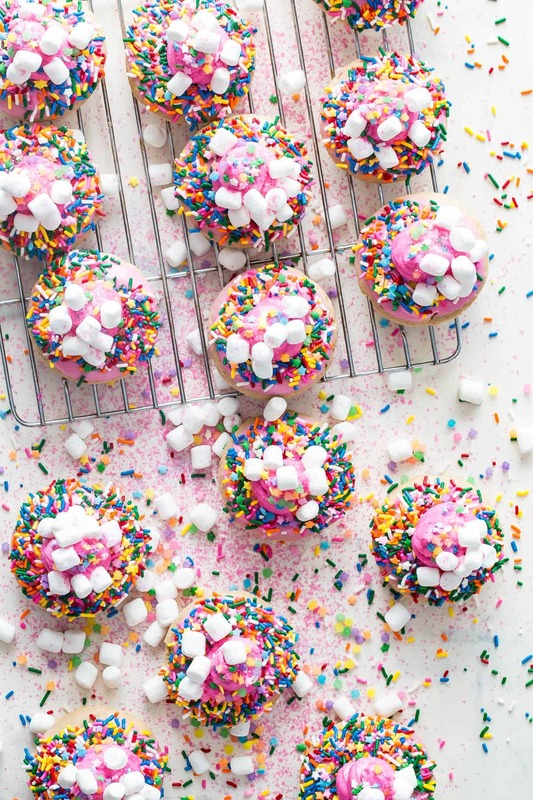 Dip the donuts into the sprinkles and let set while you make the buttercream. Beat the butter and half of the powdered sugar until smooth. Add the remaining powdered sugar and beat slowly at first then on high speed for 3-4 minutes. Add the vanilla, milk, preserves and coloring and mix well. Pipe a large swirl of the buttercream in the middle of the donut and decorate with more sprinkles and mini marshmallows. Serve at once or keep covered at room temperature. These donuts are best eaten on the day they are made. How fun are these?! You get the “Dad of the Year” award for these! 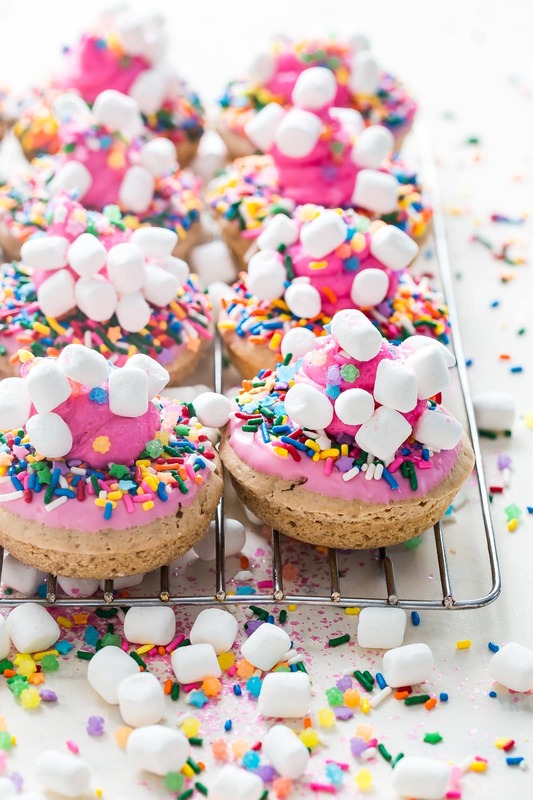 Such a fun treat for the kiddos – these are party donuts!